I've been holding off on buying yarn, recently, in an attempt to work through my stash. As a result, I've found myself stagnated and avoiding knitting for my shop; new colors and textures are what keeps me going. It has been pretty productive, this avoidance, because I've been working on projects for me, my family, and finishing up things that have been hanging around for awhile. But...I know I need to work on building up more stock! I'm already starting to get a trickle of custom orders for the holidays, and I was dreadfully unprepared last year for my etsy sales. Breaking down and buying yarn currently isn't in the cards, so I decided to whip out my bag of scraps and pull a couple of skeins of yarn out and see if I could come up with anything that suited my fancy. 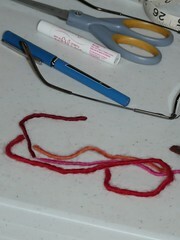 My goal was to use up some of my scraps and to use up an idle skein. Last night in the HAF critique chat, someone mentioned 'sunset colors' in relation to my orange and pink ribbed socks. I had about 5 yards of each of those colors in my scrap bag, so I pulled them out on the table and saw that a winey red looked quite nice with them. 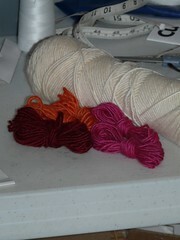 I also had about 5 yards of that, so I wound off bobbins and have them paired with a skein of cream yarn.